A few months ago, I built an all plastic Imperial jetbike for my White Scars. He was going to be for Sammael. I've since sold the White Scars and I'm overhauling the rest of the force but I wanted to share this model with you guys. I'm going to try and put a complete tutorial together on this. I've got all the pics for it (30 some of them), I just need to write the whole thing out. It will probably be a two part thing just so it's manageable. Thats seriously cool dude! Looking forward to the tutorial. BTW - do you use him in games? Or was he just for display? Better yet... he's for sale. I did use him in a couple of games though. I'm tempted to paint him up as Sammael just to see what I can do. 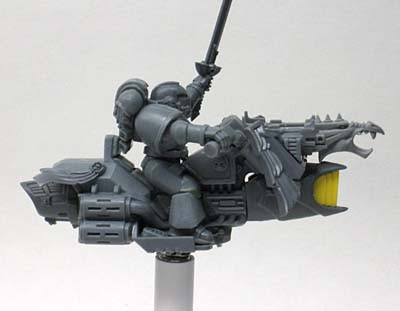 AWESOME looking model ron that makes my jetbikes hide in the bushes of envy! I'm excited to see the tutorial for this one too! It was a ton of work and costs a little bit for each bike but it has a look to it that definitely draws people's attention. Yep... It was a huge learning curve, there are a lot of things not covered in there that I learned when I built my bike.